Souko Shirami (銀鏡　蒼枯) is a celestial and a god, and the stage 1 boss of the haze route of Brilliant Pagoda or Haze Castle. Souko was very dramatically dumped in the past, so now they hide their face because they believe that they are hideous. They currently do lots of volunteer work, thinking that if their face is ugly, then they may as well work towards having a beautiful heart. However, they feel intense jealousy towards beautiful things, which in turn prompts them to dislike their own personality as well. Souko is both a celestial and a god, but due to their apparent lack of power, they are worshipped at a hokora somewhere. Because they were dumped by their loved one in the past, Souko believes themself to be ugly, hence why they are so jealous of beautiful things and cover themself in heavy clothing. Despite being a celestial, they prefer to stay on the ground. Though they are a loner by nature, they are mostly polite and humble when they encounter people. Their profile states that many people are enchanted with them, but Souko is unaware of this and are still uncomfortable with their homely appearance. 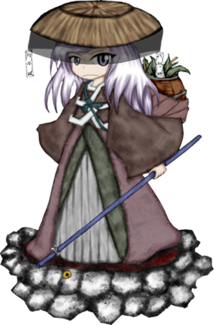 Since they dislike battles and are a pacifist at heart, they use several methods of warding away youkai, such as waving around sticks with bells that youkai dislike the sound of, or using evil-warding charms. Souko has the ability to charm people, born from their desire to be loved and because some of their internal beauty has also become external over the years. They have enchanted a great number of people, although they themself still haven't noticed a thing. Souko is likely based on the rock goddess Iwanagahime , who is the daughter of the mountain god Ohoyamatsumi and sister of the flower goddess Konohana-Sakuyahime. One legend, referenced by many of their Spell Cards, tells of how Ohoyamatsumi gave Ninigi-no-Mikoto his daughters' hands in marriage, only to have Ninigi spurn Iwanagahime because of her stony face. As such, Ohoyamatsumi said that Ninigi's descendants would be glorious yet short-lived like Konohana-Sakuyahime's flowers, rather than resilient and long-lived like Iwanagahime's stones. Iwanagahime was still deeply hurt, and eventually became so distraught at the sight of her own face in the mirror that she threw the mirror as far away as she could. The mirror landed atop Mount Ryuubusa (龍房山) in what is now the Miyazaki Prefecture, where it is now worshiped along with her. Their full name is Souko Shirami (銀鏡　蒼枯). "Souko" is composed of kanji meaning "blue" and "wither," while "Shirami" is composed of kanji meaning "silver mirror". The name "Shirami" is also similar to that of the Shiromi Shrine (銀鏡神社), one of several shrines that worships the goddess Iwanagahime, and is spelled with exactly the same kanji. Souko has lavender eyes and long lavender hair that reaches past their shoulders. They wear a kasa hat and a maroon kimono. There is an ofuda on their hat, which was made by Tsurubami Senri, claiming it to be a charm to repel demons. They are seen carrying a basket, which according to JynX is full of medicinal herbs. They stand on what is possibly a pile of rocks, in reference to their basis in legends about Iwanagahime. In Brilliant Pagoda or Haze Castle, Souko senses the incident, but pays no mind and goes to recollect medicinal herbs near the Senri Shrine. However, they encounter the heroes. When Souko encounters the heroes, Yabusame Houlen and Shion make fun of their homely appearance and call them a "low-quality good". The celestial mistakes Tsubakura Enraku for Tsurubami Senri, who sold them a demon-sealing charm in the past and is thankful for it. Yabusame and Shion start teasing Tsubakura for doing a nice deed for once while Tsubakura is confused, because it wasn't them. They decide to attack the surprised celestial. After they are defeated, Shion tries to eat their soul, but cannot, because they are a celestial and thus immortal. When Souko demands why they were attacked, Shion says that the charm was defective and Tsubakura was checking it out, but it's obviously a lie. Souko falls for it, anyway. Fumikado and their lackeys encounter Souko, who asks the group if they're heading for the incoming war and suggest them to make peace instead. Fumikado does not care about peace, only ruling Mugenri. They also make fun of their plain appearance and way of talking. Offended, Souko attacks them, but is defeated. Fumikado laughs and calls Souko a small fry, only for them to back off after Souko comments they are a Celestial and a God and thus higher than them. Embarrassed, Fumikado tries to make up an excuse and asks Iyozane for suggestions. However Iyozane's bad at lying and Souko doesn't fall for it, much to Fumikado's chagrin. This page was last edited on 12 February 2019, at 12:25.